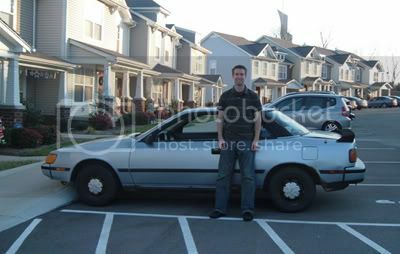 In 2001 I aquired a well-worn, much-loved light blue 1987 Toyota Celica. Quintessential 80’s car. I got it as a generous gift from our good family friends Neal & Lisa Blackwood who knew I was a broke college student in need of transportation. Prior to getting the car from the Blackwoods, the aptly named Neal-Mobile travelled some 100,000-ish miles, spent 10 hot years in Texas, and endured several sub-arctic Minnesota winters. But I was grateful to have her when she finally arrived in my care. The Neal-Mobile was a fine piece of machinery – Japanese made, reliable, quick, had to hold the handles up as you shut the doors in order to lock it. In the six years I had the Neal-Mobile I only had one engine related malfunction, which required the replacement of the distributor… all in all, not that big of deal. Like any car it had it’s share of wear-and-tear, bumps, and rust, but was quite the trustworthy little thing. I took that car everywhere. Made the trip from Nashville to Minneapolis at least 25 times. Drove it to Nebraska and back another 8 times. Drove to Coloroado twice. Took it to Ohio, Louisiana, Alabama, South Carolina, Kansas and probably a dozen other states. I drove it up and down every mountain road outside of Colorado Springs. Drove it as far as cars can go down the Mississippi River delta south of New Orleans, and I’ve got the picture to prove it. One time on one of my trips out west an Interstate bridge got washed out, so I had to go on this 80 mile off-the-beaten path detour. The traffic on the detour was so bad that I hauled out the old road atlas and forged my own road over cow fields, farm roads, and dirt paths all the way down to Colorado. The front struts going out was probably a result of that trip; my fault, not the car. But all good things must come to end, so they say. One day the uber-reliable Toyota just kind of gave out. It wasn’t one of those big dramatic things with the smoke and fire and all that… rather, after 20 years of faithful service, the Neal-Mobile conveniently rolled to a stop, in it’s parking space in front of our house, and didn’t start up again. After such a career, and in honor of the Blackwoods fulfilling my need, thought I would carry on the gesture with my little car. Called up a place that does car-donations and uses the parts sales to give to children’s charities. Filled out the form, the tow truck came, and she was gone. …yes, that was 95,000 miles in six years….